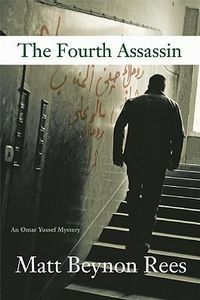 The Fourth Assassin isn't the best of this series, but that is mostly because it fails to show Omar Yussef at his intellectual best as an amateur sleuth." > The Fourth Assassin by Matt Beynon Rees, a Mysterious Review. Review: Omar Yussef tries to unravel the mysterious circumstances surrounding the murder of one of his son's friends in The Fourth Assassin, the fourth mystery in this series by Matt Beynon Rees. Omar Yussef is in New York City to attend a United Nations conference. The trip is made more bearable because his son, Ala, lives in the city with two childhood friends. When Omar Yussef visits their apartment soon after his arrival, he's shocked to discover the body of a headless man on one of the beds. Initially fearing it might be Ala, he's relieved when his son soon arrives and identifies the dead man is one of his roommates. But somewhat inexplicably, Ala refuses to alibi himself when the police arrive, and he's taken into custody. Omar Yussef is sure his son isn't a killer, but seems equally sure neither of his friends — who were once students of his — could be either. But with Ala remaining silent, and another roommate missing, Omar Yussef is determined to learn the truth, regardless of the consequences. There isn't much of a mystery in The Fourth Assassin, which is something of a disappointment, especially when compared to the intricate puzzles Omar Yussef solved in the previous books of the series. Rather, it's as if the author posited a number of questions — Can an Arab community exist as such outside of the Middle East? Can a Muslim woman embrace the customs of her faith while still exploring and enjoying the life of a young woman in New York City? Can a naturalized American Muslim police officer do his job yet retain the respect of his people? Can an Arab merchant exiled from his home in the Middle East escape his past and start anew in another country? — then created characters and a story for them to try to answer the questions. It's not always a successful exercise. In many ways the most troubling character in The Fourth Assassin, especially from an American perspective, is Ala, Omar Yussef's son. He's conflicted, to be sure, but the source of that conflict isn't always obvious. True, he's accused of murder, but even before that he's known to hate living in New York City, even the concept of New York City, where he's an underemployed computer engineer. He even calls the Muslim cop investigating the case a "filthy infidel", simply because he chose to become a US citizen. It isn't made clear why Ala is living here, or how he came about living here, but the obvious question is: why not go home, back to your family in Bethlehem? Why subject yourself to a setting that was not forced upon you, that you've voluntarily chosen to live in, when you don't have to? One might argue that, as a Palestinian, he has no home, but that isn't the point here … or maybe it is. Rees often uses environment to help set the tone for his stories, and the New York City of The Fourth Assassin is cold and wet, dark and dreary, forbidding and unforgiving. If it weren't for the practical optimism of Omar Yussef, it would be downright depressing. But this optimism is really what the story is about: there are often no easy or simplistic answers to life's questions, in fact, there may be no answers at all, but that doesn't mean one cannot — as Omar Yussef does — adapt to the challenges and avail oneself to the opportunities of an ever-changing landscape. The Fourth Assassin isn't the best novel in this series, but that is mostly because it fails to show Omar Yussef at his intellectual best as an amateur sleuth, something readers have come to expect from him. Acknowledgment: Goldberg McDuffie Communications provided a copy of The Fourth Assassin for this review.